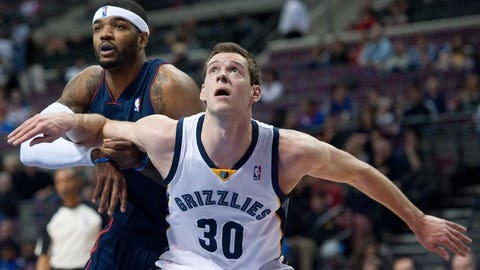 Jon Leuer matched a career-high with 23 points. AUBURN HILLS, Mich. (AP) — The Grizzlies needed one half to figure out the Pistons. Once Memphis realized that Detroit couldn’t hit a jumper, the Grizzlies packed the paint on defense and outscored the Pistons by 33 points in the second half on the way to a 112-84 victory. Zach Randolph finished with 16 points and 16 rebounds for Memphis. "We were struggling against their post players in the first half, so we made an adjustment and really tried to take away the paint," Grizzlies coach David Joerger said. "They were playing zone against us, but Zach was able to get inside and disrupt things, and that opened up some kick-out shots to our 3-point shooters." Detroit lost its fourth straight and fifth in a row at home. The Pistons are now 4-10 after a 10-10 start. "This is most definitely an emergency right now," Brandon Jennings said. "It is slipping away from us. You start questioning if everyone is willing to sacrifice and do the things that we need to win games." Pistons coach Maurice Cheeks met with his players after the game to try to find a solution. "I’m trying to get some insight from them, and we’ll talk more tomorrow," he said. "When things happen like this, and we don’t have any ball movement, that’s on me. I have to find a way to do that." Detroit missed 16 of 20 second-half jump shots, managing just 28 points after a 56-point first half. Jennings went 0-for-7 in the half. "Right now, for some reason, we’re just a first-half team," Jennings said. "We aren’t coming out with the same energy in the second half, and we’ve got to find out why. This is ridiculous right now." Memphis got a big game off the bench from second-year player Jon Leuer, who had 23 points and eight rebounds in 21 minutes. "Jon did a great job last year of honing his game all through the season — he was still working hard in March and April when a lot of players have hit the rookie wall," Joerger said. "This year, he’s taken things another step, and you can see where it has paid off. He’s got the shot fake that can set up a drive, and he’s doing more things off the pick-and-roll." Memphis had six players in double figures, including 15 from former Piston Tayshaun Prince. Prince acknowledged that he gets a boost from returning to the building where he won the 2004 championship. "It’s always special," he said. "You always have some incentive to hopefully go out there and get a team win. This team does a great job that when someone is facing their former team, everyone steps up to help them." Greg Monroe led Detroit with 19 points, while Andre Drummond added 15 points and 14 rebounds. But they combined for only eight points in the second half. "It definitely hurt playing like that in the second half," Drummond said. "To let them come out and do that — that’s definitely tough to swallow." The Grizzlies continued to alternate wins and losses, going 3-2 in their last five without back-to-back victories or defeats. Both teams were short-handed in the backcourt. Detroit’s Rodney Stuckey (shoulder) missed his second straight game, while Tony Allen (hand) was added to a lengthy Memphis injury list. NOTES: The game was played in front of a very small crowd, with a winter storm dumping up to a foot of snow in the Detroit area. The Pistons played a special video on the scoreboard during the third quarter, thanking the fans for coming out on such a nasty day. … Prince received an ovation during pregame introductions. Prince was playing his second game as a visiting player at the Palace after being traded to Memphis last season. … Memphis wore its home white jerseys with Detroit wearing its Sunday navy blue "Motor City" third uniforms. … Brandon Jennings and Ed Davis picked up technicals for trash talking during the fourth quarter.